The 510 Design Careen 4-piece Comforter Set offers a simple and charming update to your bedroom decor. This ultra-soft microfiber comforter and shams feature a pieced design with pintuck details, in green and blue hues, adding dimension and texture. A decorative pillow with pieced detailing completes the look of the top of the bed, while a solid blue bed skirt provides a clean finish touch. Pairing perfectly with any transitional style decor, this comforter set is machine washable for easy care. Nice design and colors. The items came as per the photographs. 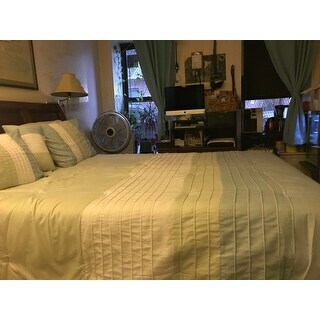 A bit on the thin side, so if you are looking for heavy duty winter comforter sets, look elsewhere. Otherwise, does great for our mild Texas winters, inside heated houses. I live in FL and love the light colors--just makes me smile. I thought from the reviews that the comforter would be less bulky than it is and there is some wrinkling of the blue end color that I unfortunately need to put at the pillow end since I wanted to bring out the color in the painting above it--which it does. I think it is too thick to use in the summer like I wanted unless I fold it down to the bottom of the bed overnight. I don't think I would have wanted it for the winter if I were still up north. Very happy about the set and will recommend it,thank you! My first purchase from Overstock. Good value for the price. Shipped on time. Would recmmend Overstockto others. very nice weight good for all seasons. Very cherry ! As a birthday gift and a need for my daughter... I liked how it looks and the reviews weren’t bad.